Tongariro National Park, home to the major volcanoes of New Zealand’s North Island. And where there are mountains, there will be streams of water flowing down from the high elevations, and where there is flowing water, with a little luck there will be a waterfall or two. Ketetahi Falls is one of the smallest named falls within the National Park, but that makes it no less picturesque and worth a visit. Located at the end of the popular Alpine Crossing hiking trail, most hikers pass it right by in the desire to finish their hike, instead I decided to start at the end and hike back less than a mile to the short off-shoot trail down to the falls. 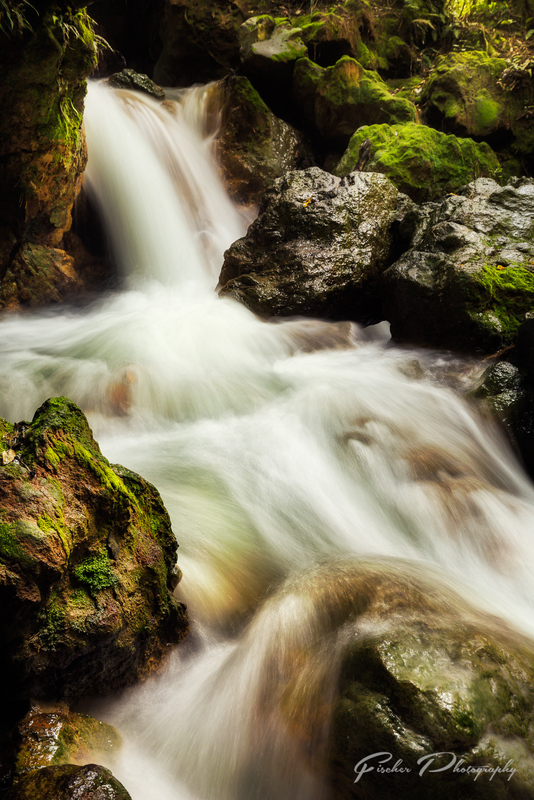 Ketetahi Falls consists of several small cascades through the steep rocky terrain that flanks the hiking trail. This shot captures the top to middle sections of the falls, the tallest lower drop was inaccessable without great difficulty and risk to both gear and limb – being on a solo trip I opted to only take the moderate risks for the best possible shots. Getting to this composition only required taking a few steps off the spur trail to get a good perspective on this section of the waterfall. Framing the cascades so that the top of the falls enter the frame along the left 1/3rd line (yes, that always there rule of thirds), pulling in to nearly the full zoom range of my 16-35mm lens to get the waterfall to fill as much of the frame as possible and eliminate some of the unwanted distractions in the peripheral areas of the frame. 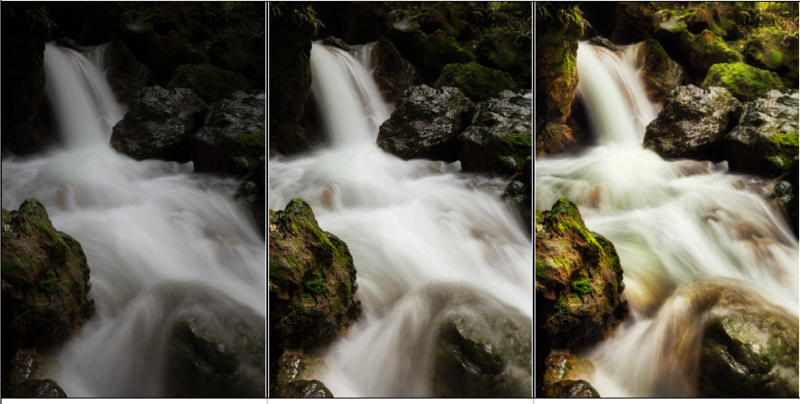 With the varying hues of color not only in the rocks and mosses, but also in the moderately fast moving water itself, I decided to go with what I consider a middle-range shutter speed for shooting waterfalls. On waterfalls that are made up of multiple cascades such as this, I don’t like to go super long on the shutter speed, keeping an element of texture in the water. For this shot, I used my 6-stop ND filter and a low ISO setting to get the 2 second shutter speed without needing to resort to a very small aperture which would reduce the image quality due to diffraction. The processing on this photo follows my normal workflow. Starting in Lightroom I do the initial RAW edit, adjusting contrast and white balance through the basic panel, setting the lens corrections and doing initial RAW sharpening before moving into Photoshop. For this photo 3 base images were used, making it a 3-image blend (bottom 3 layers in the Photoshop screen above). Layer masks were used to blend in portions of a brighter and darker frame into the base ‘middle’ exposure. Once satisfied with the overall exposure of the resulting image I transitioned into the final creative edit. Using a combination of Photoshop adjustment layers, a Nik Color Efex layer and several burn-dodge layers, the creative edit on this photo put an emphasis on tuning the color hues and light to bring out the natural beauty of the scene as I remembered it. The color contrast between the warm orange hues in the rock and green mosses was carefully accented in the foreground rocks, the rocks in the mid-to-background had a nice reflection that added another element of contrast to the softer green mosses in the top right corner. 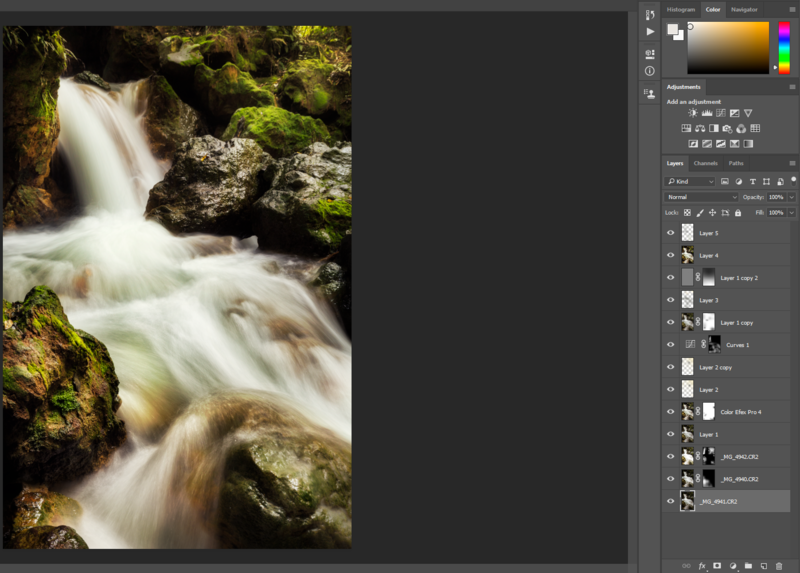 4 separate Overlay layers and one Soft Light layer are utilized to add contrast and color through the dodge/burn process. The all-gray layer third from the top is a high-pass layer used to sharpen the details in the foreground, you’ll note the layer mask which hides the sharpening from the top half of the image almost entirely.